What is a recreational craft? A recreational craft is solely designed for sport or leisure purposes and carries not more than 12 persons. Recreational craft comprise motorboats, sailboats, yachts and water bikes („jet ski“). German-flagged recreational craft are covered by German law, partly based on European directives. The scope of safety requirements to be met by such craft differs for craft operated commercially and non-commercially. Recreational craft which are solely used for leisure purposes need neither approval nor certificates of the German flag state administration. For equipment of recreational craft solely the provisions of the Convention on the International Regulations for Preventing Collisions at Sea, 1972 (COLREG) regarding navigational lights and equipment for sound signals have to be observed. Further information regarding these requirements is outlined in a brochure (in German only) by the Federal Maritime and Hydrographic Agency. In addition, recreational craft of 15 m length and above, even if not operated commercially, must be registered in a German shipping register. Cruising on German waterways with privately owned recreational craft requires a Sportbootführerschein (recreational cruising licence) according to the "Sportbootführerscheinverordnung" (German recreational yachting navigating licences ordinance). Further information is available from the Deutscher Segler-Verband (German Sailing Association) or from the Deutscher Motoryachtverband (German Motor Yachting Association). Recreational craft for onboard professional training. 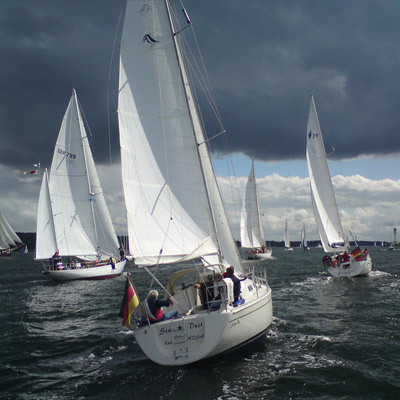 Both kinds of professional use of recreational craft are regulated with the "See-Sportbootverordnung" (German maritime recreational craft ordinance). is sufficiently marked for identification. These requirements for chartered recreational craft under German flag are applicable not only in German waters but world wide. The boat certificate is issued with a period of validity of two years, or three years in case of newbuildings from shipyards. Prior to issuance of the boat certificate the recreational craft is examined for safety and the required marking, preferably before the cruising season starts. Normally an expert of a Wasser- und Schifffahrtsamt (Local Office for Waterways and Shipping) examines the boat. It is however also possible to employ experts of the ship safety division of the BG Verkehr or of a recognized organisation (classification society). Further information and the application form is available on the website of the Wasser- und Schifffahrtsamt Stralsund (Stralsund Local Office for Waterways and Shipping). Beside chartering, another kind of professional use of recreational craft is the training for navigation of chartered recreational craft or for similar sport and leisure purposes (training craft). Professional training means that the training is provided on a commercial basis. German-flagged training craft require a ship safety certificate and a safe manning certificate. The ship safety certificate is issued by the ship safety division of the BG Verkehr with a period of validity of not more than two years. For training craft a boat certificate is not sufficient. Summary of the training concept. Furthermore, the training craft is surveyed by a surveyor of the ship safety division. In addition the on-board radio equipment is surveyed by the Bundesamt für Seeschifffahrt und Hydrographie (BSH, Federal Maritime and Hydrographic Agency) or one of their agents. Further information about the respective surveys is given in our section on "Ship Surveys". If liquefied gas is used on board, the gas installation must be approved by a certified company. A training craft must be manned with a crew in accordance with the provisions of the "See-Sportbootverordnung" (German maritime recreational craft ordinance). The required crew depends on the size of the craft and on the cruising area as specified in annex 4 of the "See-Sportbootverordnung". the "Richtlinie für Ausbildungsfahrzeuge" (directive on safety requirements for commercially used recreational craft) pursuant to the German Schiffssicherheitsverordnung (ship safety ordinance) in the version of 1997, section 52a. The directive continues to be applicable based on the German See-Sportbootverordnung (German maritime recreational craft ordinance), section 14. Larger recreational craft of 15 m length and above must be registered in a shipping register, regardless of being commercially used or not. Smaller craft may be registered voluntarily on application of the owner. We put together a list of the shipping registers for you. Prerequisite for a registration in the shipping register for sea-going ships is a tonnage certificate. Further information as well as an application form is available on the BSH-website.